There's nothing like a cool drink on a warm day; everyone has a fond memory of enjoying their favorite summer beverage whether it's a bottle of Coke or a cold beer. A great way to make your company and brand a part of that memory is with promotional coolers imprinted with your company logo! 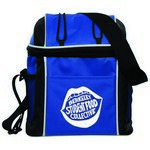 Our Voyager Cooler Bag features a front pocket and side mesh pocket, Customizable with your brand logo.